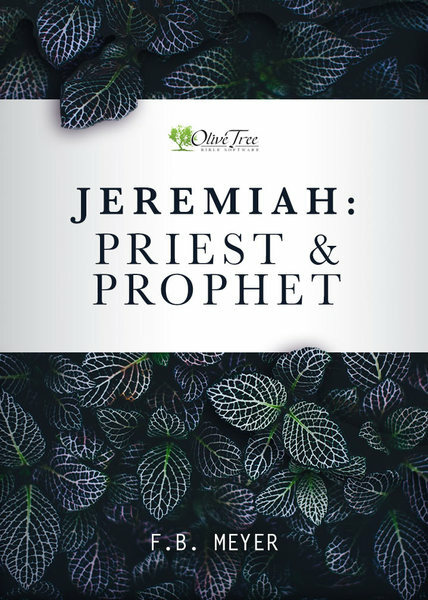 "Jeremiah has always a fascination to Christian hearts because of the close similarity that exists between his life and that of Jesus Christ. Each of them was 'a man of sorrows, and acquainted with grief'; each came to his own, and his own received him not; each passed through hours of rejection, desolation, and forsakeness. And in Jeremiah we may see beaten out into detail, experiences which, in our Lord, are but lightly touched on by the evangelists." One of the greatly loved preachers of his day, Frederick Brotherton Meyer was a pastor, author, Bible teacher and evangelist. He was born in London in 1847 and grew up in a Christian home. In 1895 he went to Christ Church in London, with only 100 attending. Within two years he was preaching regularly to over 2,000. He remained there for fifteen years and then began a ministry of conference preaching and evangelism, traveling to South Africa and the Far East on mission endeavors. He returned to England to pastor for several years before he died in 1929.